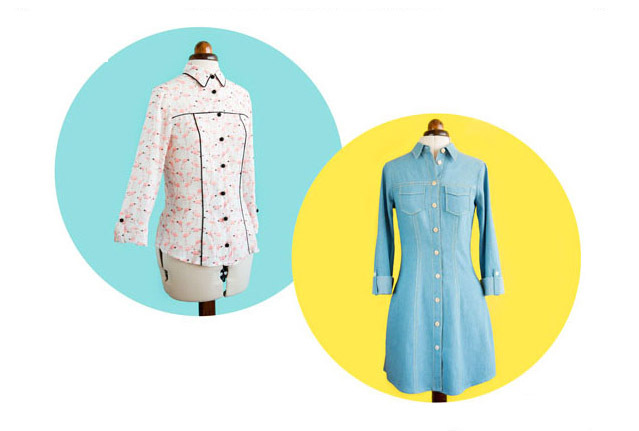 This is Dorte’s stunning Rosa Dress & Shirt from Tilly and the Buttons. 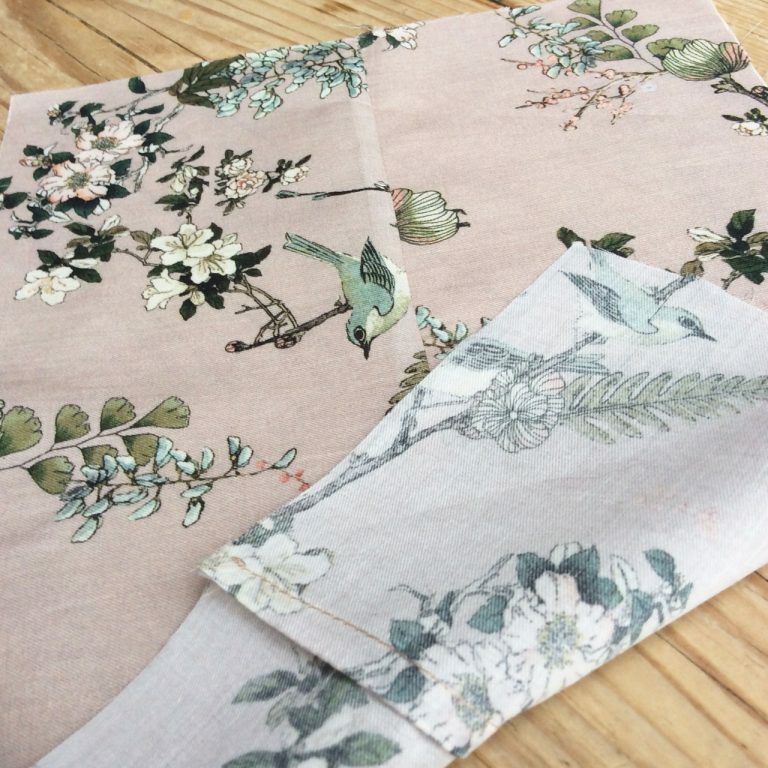 She has used French Seams here, with the Spring Serenade Cotton Lawn. This lawn is soft but stable, with a high thread count making it extra comfy on the skin. The colour palette is really unusual but subtle. 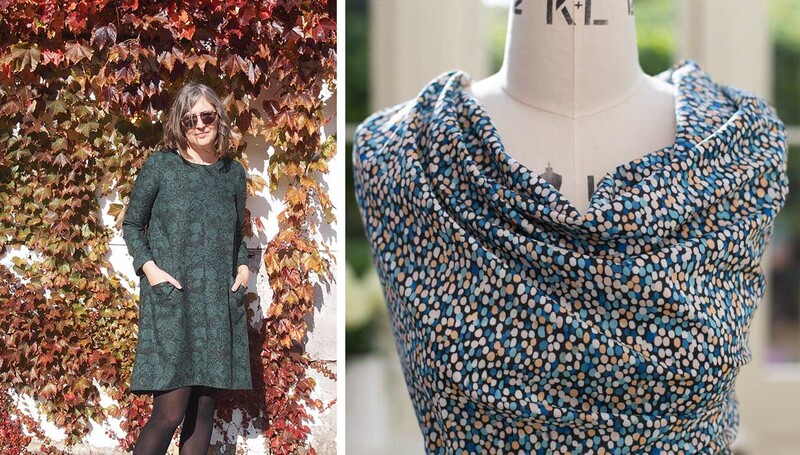 The Rosa Rosa Dress can be worn with tights and a jacket for those not so warm spring days, the shirt looks great with a knee length skirt. 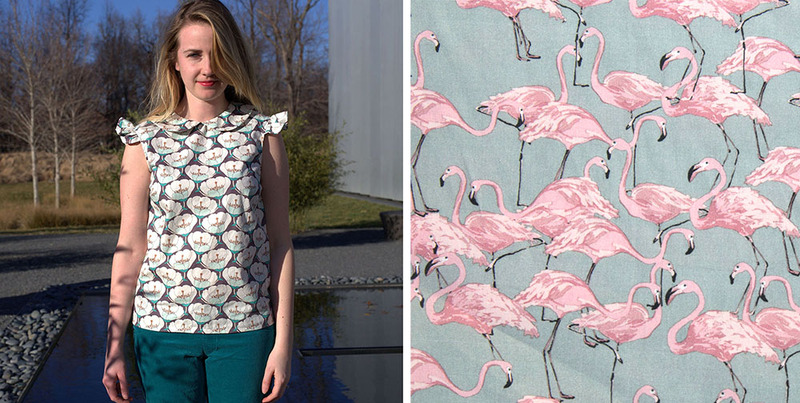 This cute Wendy Top from Sew Liberated is perfect for our new Flamingo Cotton Lawn. The Wendy top has ruffled cap sleeve, a peter pan collar, a keyhole back. it’s an easy style, making it a perfect top for all your spring and summer styles. Simple construction means you can have yours made up in no time. Paired with jeans, shorts or a skirt, the Wendy Top will be your favourite top. 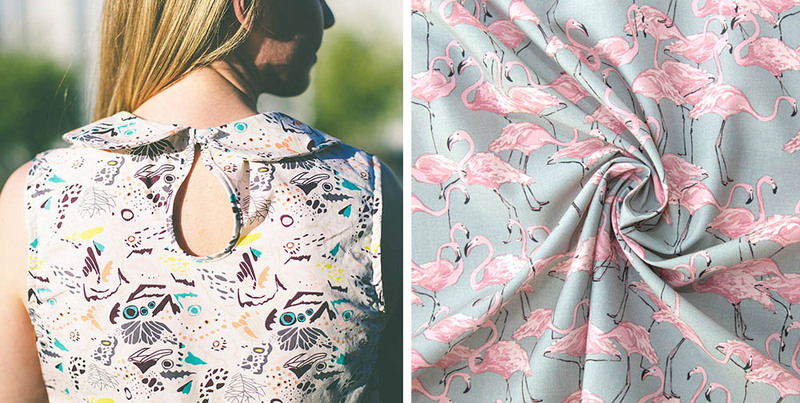 This is going to look fun and cute in the Flamingos, which have proven very popular at Dragonfly Fabrics. 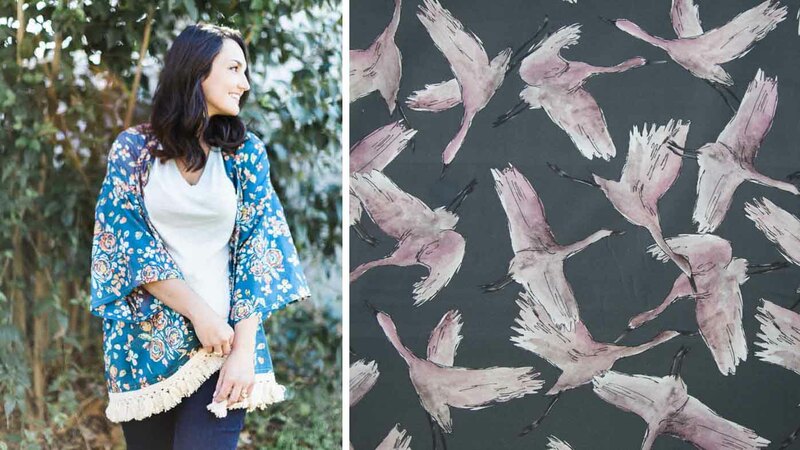 The gorgeous Florence Kimono from Sew Caroline is a wardrobe must have, easy to throw on over a pair of jeans or leggings in the spring (or shorts in the summer!). It’s simple style is always making a statement and makes it easy to dress up your typical jeans and tee look. 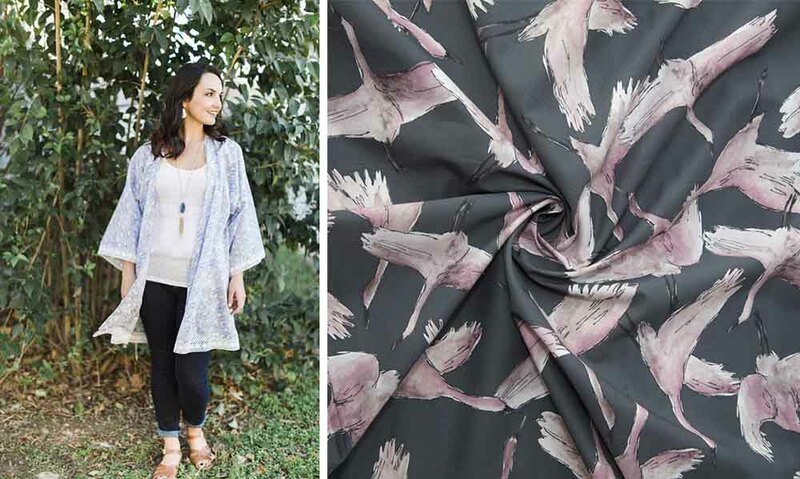 This flowy jacket takes minimal time to sew up and can add flair to any wardrobe. Perfect to brighten up those fresh spring days. You could use any Cotton Lawn, but we have picked the Flying Flock Navy Cotton Lawn for this pattern. Like our other Lawns it’s 100% cotton, light weight and soft to the touch, but opaque and stable for sewing. The relaxed peg-shaped trousers are easy-fitting at the hip, with slash pockets for nonchalant slouching, tapering into a slim line ankle. The waist has gentle shaping from pleats and darts, cinched in with a quick-sew elasticated waistband. The jumpsuit bodice is shaped with bust darts and a sweetheart neckline, with a comfortable blousy waist, wide (bra-concealing!) shoulder straps, closing with an invisible zip at the side. Wear Marigold with heels and a statement necklace for bossing it at the office, or with plimsoles for lounging at home or picnicking in the park. The jumpsuit also looks great layered over tops, so can carry you through to the milder months. 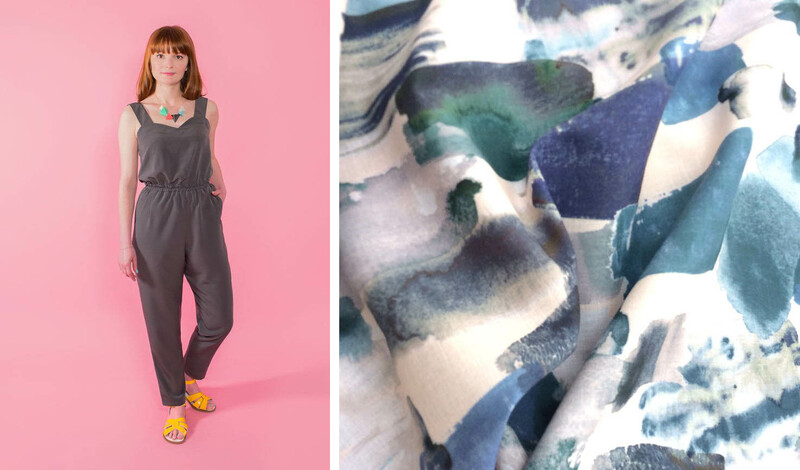 We think the Marigold would look lovely in the Cotton Lawn Brushstrokes. The Farrow features an elegant A-line shape with flattering diagonal seaming concealing inseam pockets, and a jewel neckline. The long sleeves will keep you snug and warm while we wait for warmer weather. Layer it with tights and a cardigan if you need to. Dress it up with heels and dress it down with boots. This pretty Cotton Lawn Pebbles would be great for the Farrow Dress. This flattering, easy-to-sew skirt is a great everyday piece that can be made in a variety of fabrics. Details include practical front pockets, smooth side panels that don’t add bulk, and an elastic back to eliminate zippers and buttons. The skirt can be dressed up or down depending on your fabric and styling choices. 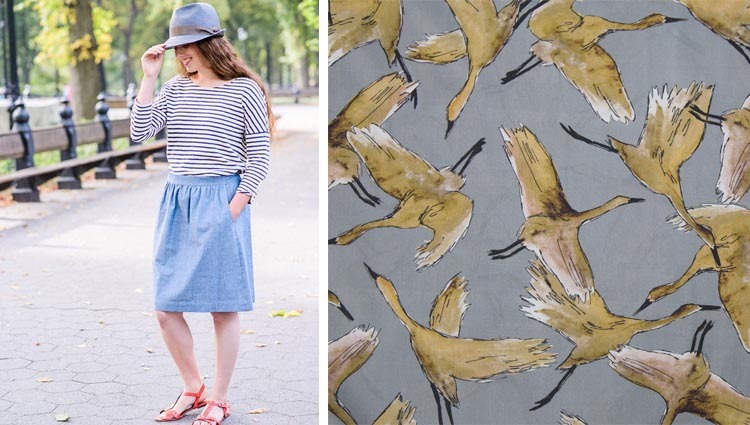 We love the idea of using our Cotton Lawn Flying Flock Ochre for the Everyday Skirt, wear this any time with a plain top or light jumper with heels or flats. For plain Cotton lawns or Printed Cotton Poplins visit our website. 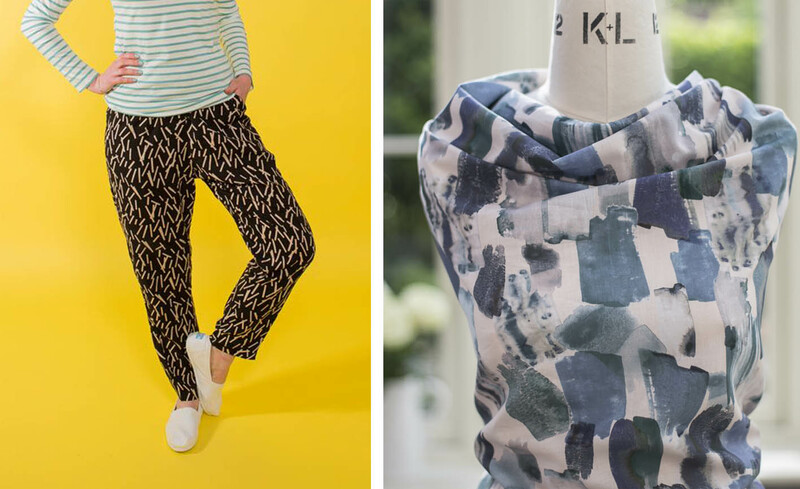 We hope you enjoyed reading this post, don’t forget to check our Sale page, most of these beautiful fabrics above are discount at the moment, don’t miss out! We are updating this every few days, but they don’t stick around long. You can also email to ask for advice or information on any of our products;sales@dragonflyfabrics.co.uk. Visit our website for lots more NEW fabrics!